I was catching up on my blog reading earlier this week and read a post on The Motherhood about the importance of photos and it inspired me to get snapping more. Sure, I take lots of photos of Ethan and other things that catch my eye each day but really, when I look back at the snaps we've taken in the past year or so, barely any exist of just me and hubs or all three of us together. In fact, as a trio, I think we have just a trio of photos. 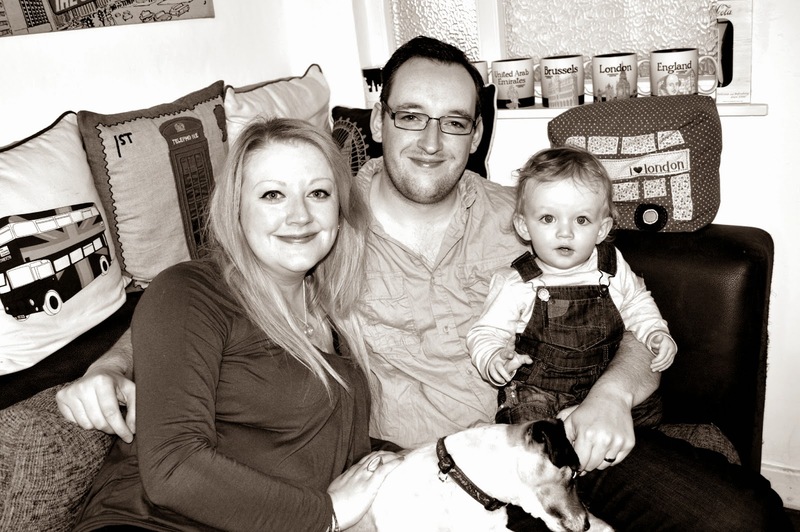 I want to have complete memories of our family as a whole so I'm taking a leaf out of Lucy's book at Dear Beautiful and Katie from Mummy Daddy Me and starting an album of family photos, taken once a month, for the Me and Mine project. Now, it's not a fancy photo and it's just taken in our dining room, but it's the first chance I've had to take one of the three of us (plus our dog Watson popped in at the last second) so I wanted to get the ball rolling. Hopefully we can build a nice collection of varied photos as the months go on. That's a lovely idea. I don't know when last had a full family photograph taken. I can't claim it as my own but it's something that everyone can try to do. Plan one in or do one ad hoc - it doesn't need to be fancy (as my pic above goes to show! ).